Best wishes to you all for a Happy Easter! Whatever your religion or beliefs, I hope you enjoy this time of rebirth, renewal, and warmer days. I was reading a message board the other day concerning classic picture books that make you wonder how they ever got published. 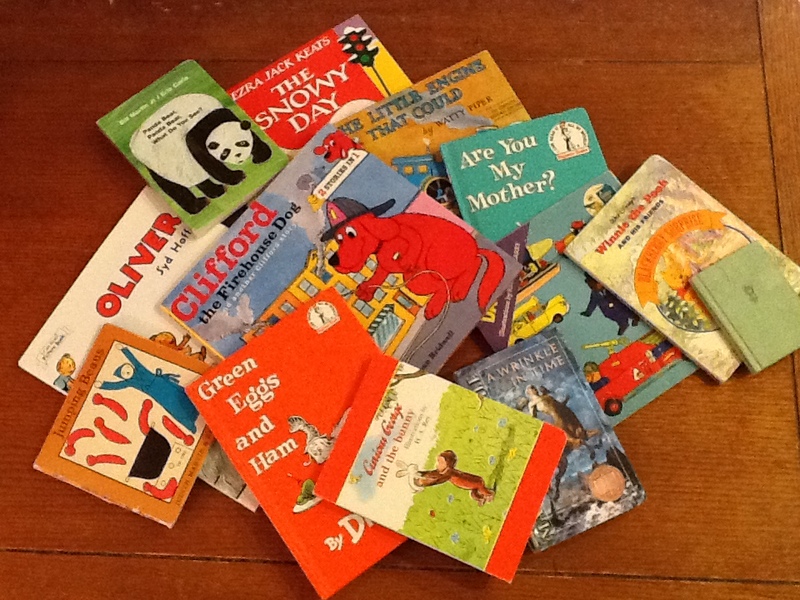 Part of the discussion centered around how the children’s book market has changed over the years. The approach to children’s education and the state of the children’s book market was quite different seventy, fifty, or even twenty years ago. I wrote a previous blog post on some of the classics, and how they hold up. What was most interesting to me about this discussion was not the different opinions about why classics are classics, and why some hold up throughout the years, and some do not. What I saw when I read each post was this: Everyone likes something different. Several specific books were mentioned, especially Madeline. There were some pretty strong opinions on why they loved the book, or not. Some loved it, some hated it. I myself don’t get the appeal of Madeline. The character strikes me as a spoiled brat who is put into a variety of unrealistic (but not fantasy) situations. Regardless, I may not like it, but clearly others do. Some people may find several of my favorite books annoying or dated. But we all, as readers (children and adults alike) like something different. Editors and publishers today may focus primarily on what will sell the most copies. They must analyze and assess the market of today, and what meets the needs of the bookstore, online, and school markets. I don’t envy them the challenge of trying to float a ship on the changing tides of pop culture and educational theory. As I writer, I have had many arguments with myself (quietly, I promise) about whether to ditch the story I really love in favor of something more commercially viable. As I advance my craft, I strive to create stories that meet both my personal requirements and the needs of the current market. But I must start at the beginning: writing what is in my heart. Perhaps what I write will be sellable someday (hopefully!). But if I don’t write what is in my heart, I believe it won’t speak the truth or touch my readers in any way. And if everyone likes something different, perhaps instead of trying to speak to everyone, I should strive to speak to someone. So in the end, whether a story meets the technical requirements of today’s market or not, it must start in a personal place. And that’s good news. The joy of writing down the stories that are begging me to be written, those that occupy a special place in my heart and mind, are why I write in the first place. Have you every just needed a moment to escape your thinking? Whether you are writing, or worrying, or trying to puzzle something out, sometimes we need a way to step back and refresh. For me, when I’m mentally stuck or really deep into something that I can’t see the way out of, I try to think about something else. Not procrastinate – just a brief diversion. Just enough to come back a few minutes later with a refreshed perspective. Think of it as a mental spa treatment! Write something. If you are taking a break from your writing, write something else completely different: a poem, a list, or a writing exercise. Call someone that you really enjoy talking to. If they are not home, leave them a message about why you enjoy talking to them. Step outside and take a deep breath. Pick some flowers/weeds or go looking for signs of Spring. In one of my current works in progress, I am writing about a brother and sister who discover a doorway in their secret hideout in the hall closet. It takes them back to 1983. I have fond memories of the 1980’s, so I am thoroughly enjoying writing all of the atmosphere and observations. Not to mention the parachute pants, big hair, and leg warmers. Think back to a time of fond memories for you. Write a paragraph or list of the things that immediately come to mind about that time. It could be events, things, or people. Try to include all five senses: what did it smell like, what did it look like, what is a taste you remember, what could you feel or touch, what did you hear? Don’t get caught up in writing something formal. You can write this as a list, as a letter to yourself (now or then), or as a stream of consciousness. Then close your words up into your journal, stick them in your wallet, or tuck them in your bag. Put them somewhere for you to find when you need another moment to step away. What time would you escape to in your mind? Please share with us in the comments! We found this at our local bookstore, and fell in love with the bunny main character. 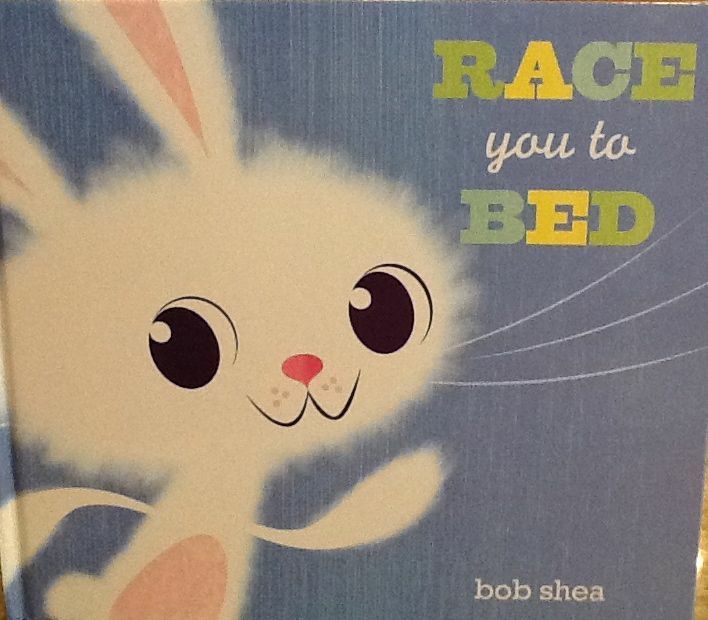 A fuzzy bunny races the reader to bed – running, on a boat, on a plane. All in charming rhyme. The text is fun to read aloud for adults and kids, using nontraditional rhyme. The main character is drawn with big feet and fuzzy all over, which makes him visually interesting. Each page is a surprise to see what he’s going to do next. What Did My Son Aidan Think? Both my son and my daughter love this book. It is in frequent bedtime rotation at our house. Unfortunately, it does not make them hurry off to bed. Our favorite part is a personal one. 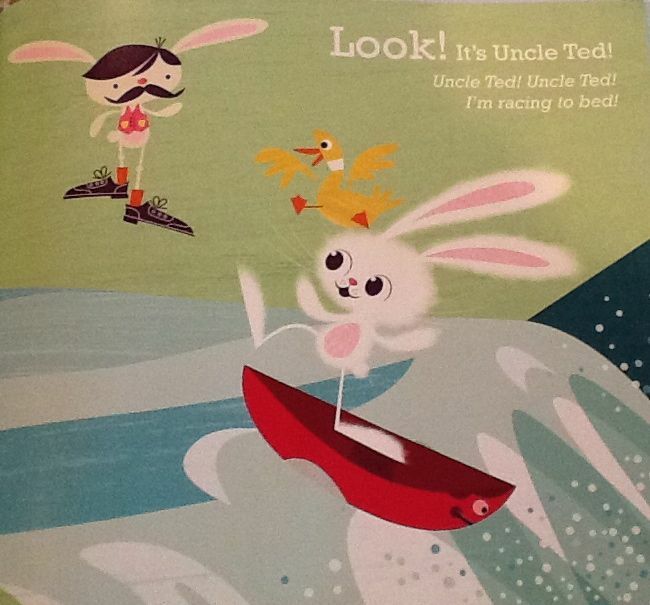 At one point in the story, the bunny comes across his Uncle Ted. My kids also have an Uncle Ted, who is a snappy dresser himself. – Which Version is Your Favorite? Read the book to your favorite child reader with your best bunny voice, and then challenge them to read it creating their own voice. You can even check out a video version made by Bob Shea. Then vote on which one was your favorite. – The bunny has to overcome many obstacles to make it to bed. Talk about what obstacles they might have in their day. Or even what gets in their way as they get ready for bed.